Despite falling pregnant and getting married at the age of 18, Ruth Kalinga-Chirwa still managed to attain higher academic and professional qualifications. She is now a champion of keeping girls in school through her reusable sanitary project. As an environmentalist, the 42-year-old has come up with the re-usable sanitary pad initiative to curb toilet blockage problems in schools with flush toilets for better and conducive learning environments and, also, to keep girls in school. “We trained different mother groups in re-usable sanitary pad making. We also trained them on negative cultural beliefs and taboos surrounding menstruation, which hinder girls from learning in districts such as Nkhata Bay, Nkhotakota, Dedza, Balaka, Machinga and Chikwawa. “We do this with aid from Forum for African Women Educationalists – Malawi Chapter (Fawema), United Nations Children’s Fund (Unicef), Save the Children, Participatory Initiative Development and Water Aid,” Kalinga-Chirwa explains. The magic of reusable sanitary pads is well noted at Liwonde Secondary School, Fawema’s centre of academic excellence. “The pass rate and retention rate for girls at Liwonde Secondary School changed tremendously after the introduction of reusable sanitary pads at the school. The pass rate for girls in the Malawi School Certificate of Education (MSCE) was 20 percent in 2009, but rose to 39 percent in 2010, 55 percent in 2011 and 70 percent in 2012. “And some girls have been selected to universities and colleges, which was not the case before, indicating that menstrual hygiene management is an issue in girls’ education, and girls can do better if this problem is addressed,” says Kalinga-Chirwa. Kalinga got married in 1994 after falling pregnant soon after the MSCE examinations. She started as a temporary primary school teacher in the same year and later went for a one-year teachers’ training course at St. Joseph Teachers’ Training College and obtained a primary education teaching certificate in 1996. 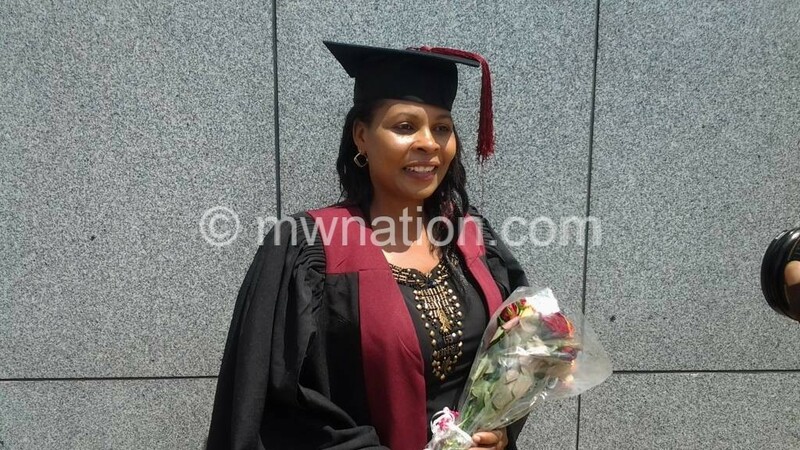 Later, she attained a diploma in secondary education from Domasi College of Education in 2005, a Bachelor’s degree in Science from University of Malawi’s Chancellor College in 2007 and a Master of Science in Environmental Science from the same University in 2013. “I applied for a diploma course at Domasi and got successful in 2001, after applying for three times. After that, I became hungry for education. “I was bitter because some of my friends I worked with at St Mary’s Secondary School made it to university, something I did not achieve because of childishness. So, although I got married to a man who was taking care of me, I felt the need to further my education so that I could not suffer like my mother did if my husband [God forbid] changed his mind and ended the marriage,” she explains. From a young age, Ruth, the last born of eight children, was taught to persevere in hardships of life. Her mother was jobless, having dropped out of school because she could not handle menstruation while at school. The mother of three has played various roles in girls’ education. Kalinga-Chirwa also has passion for education, especially girls’ education, which is another reason she embarked on the reusable sanitary pads project. She has served in the Ministry of Education, Science and Technology (MoEST) for 23 years teaching in primary school and secondary schools. She was recognised by Malawi Institute of Education (MIE) as one of the teachers with best teaching practices in Malawi. She was trained in critical thinking at MIE with 71 other teachers for demonstrating a hard working spirit. She also serves interests of girls’ empowerment as a mentor Despite falling pregnant and getting married at the age of 18, Ruth Kalinga-Chirwa still managed to attain higher academic and professional qualifications. and role model. She served as Campaign for Female Education (Camfed) and Fawema teacher mentor. “It was the time I was posted to Liwonde Secondary School in 2007 and was chosen as a teacher mentor. That was the time I started following girls’ performances with keen interest. Hence, I noticed that many girls were struggling with education due to long distances to school, and poverty. “The school used to have high numbers of girls dropping out and performing poorly. So I started guidance and counselling sessions with both boys and girls. Then Fawema established Liwonde Secondary School as its centre of academic excellence,” she explains. The trainings from both Fawema and Camfed as a teacher mentor exposed her to issues of gender pedagogy, sanitary pad making and menstrual hygiene management and how to work with mother groups—all to assist the girl child to remain in school. “I concentrated much on reusable sanitary pad making after realising that this area is often ignored. My mother was also a victim of cultural beliefs surrounding menstruation and she failed to proceed with her education once she started menstruating. This affected our living standards,” she says. With the help of Fawema, she also wrote proposals for the construction of a girls’ hostel and World University Services of Canada (WUSC) accepted the proposal. A group of six engineers from Sherbrook University constructed the hostel in 2014, which girls are enjoying today. Kalinga-Chirwa has embarked on several other initiatives aimed at ensuring that girls are empowered, including lobbying for bursaries for needy girls and boys; guidance and counselling, which raises girls’ self-esteem and role modelling, which has made girls, married women and even some men to further their education. The educationalist is currently writing a book on Menstrual Hygiene Management and Sanitary Pads. She plans to study for a PhD. Concluding, she says menstrual hygiene management is an issue contributing to low performance and high drop-out rates in girls. She calls on the public to join hands and break the silence on the taboos and cultural beliefs surrounding menstruation. Married to Emmanuel Chirwa, Ruth Kalinga, born on November 2 1975 at Balaka District Hospital, is mother to Vitumbiko, Yankho and Thandiwe.